Anyone interested in learning to needlepoint can easily learn how to make quickpoint projects in a fraction of the time it takes to stitch regular ones. This super quick way to needlepoint is perfect for last-minute gifts and needlework projects on your list that you don’t have enough time to finish before a holiday or special occasion. A typical quickpoint project can be finished in half the time it takes to needlepoint on smaller canvas sizes with customary fibers and threads. Not only is the quickpoint the easiest way to learn the art of needlepoint; it’s also the perfect canvas embroidery craft for kids. You can usually find inexpensive quick point kits in the toy section of many department stores. 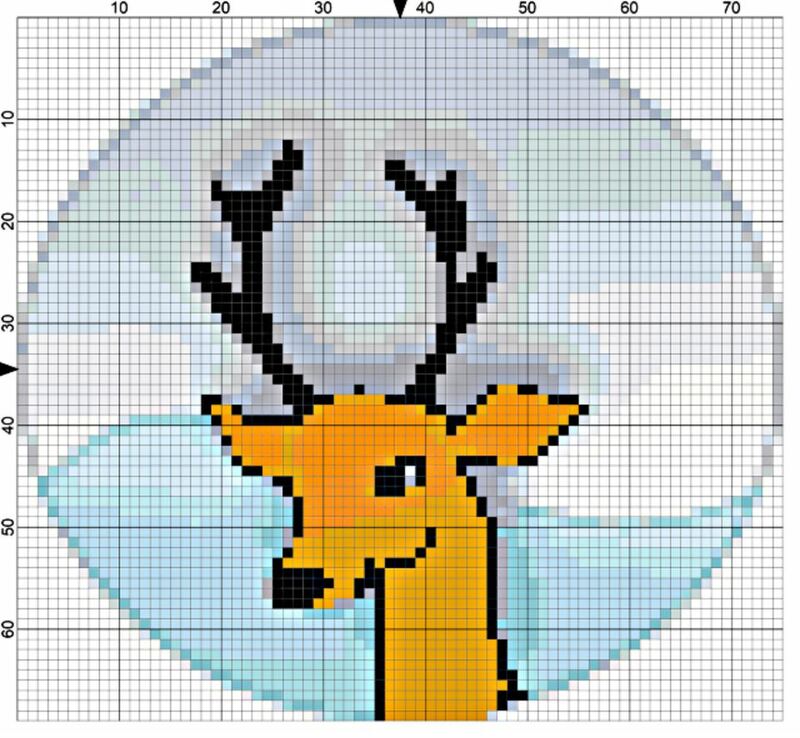 You can turn any charted needlepoint design like the Reindeer Pattern in the above image into a quickpoint project by changing the size of the canvas and adjusting the weight of the thread. No need to modify the needlepoint pattern; simply work the design as presented. Here is what you'll need. Rug or Large-Hole Plastic Canvas with 3 to 5 canvas mesh per inch works best. Knitting Yarn including medium or worsted weight, single-ply thick or bulky cotton yarn (like that used for dishcloths), or acrylic or Persian rug yarn (a more expensive approach). Large Eye Tapestry Needles with blunt tips that are designed for making rugs. The larger the needles and canvas, the quicker you can complete the project. The same stitches used in traditional needlepoint will work for quickpoint with the same successful outcome, yet much quicker results. The most commonly used stitches are a diagonal tent, continental, and basketweave stitch techniques, which help to show the detail in a needlepoint design and prevent distortion due to the large holes in rug canvas. Although not ideal, decorative straight needlepoint stitches like Bargello, Gobelin, and Mosaic can produce beautiful textures and effects in quick point; but the stitches should be no more than 4 threads long or you will see gaps in the completed needlework. Select a needlepoint pattern and convert the design measurements to fit rug or plastic canvas used for quickpoint. For example, if a needlepoint design is 75 stitches wide and 69 stitches long on 14-mesh mono canvas with a finished size that’s 5.36 inches by 4.93 inches. For your quickpoint project, you will need a piece of 5-mesh rug canvas that’s approximately 15 inches by 10 inches for the design areas. Add at least 3 inches to these measurements on all sides to determine how much rug canvas you should buy, and then shop online or at a craft store for good quality rug canvas and yarn. For plastic canvas, purchase pre-cut shapes or a sheet that’s 5-mesh and cut it into your chosen shapes and then start to stitch. You’ll only need minimal backing when stitching is done and no blocking is required! Choose the thread you will use to work the quickpoint design. If you are a knitter, sort through leftover yarn to see if any can be used; or buy new thread in colors that match the needlepoint pattern. Decide on the needlepoint stitches and the effect you want for the finished quickpoint. If you desire texture, consider cross stitches. Experiment with French and Bullion knots and other specialty stitches for special effects. Center and draw the design measurements on the canvas with a waterproof marking pen. Color in the outline of the needlepoint motifs so that you will know where to begin and end your stitching. After stitching has been completed, you will need to block the quickpoint by mounting it on stretcher bars or pinning it to a blocking board. Use basic blocking techniques to finish the needlepoint. Embellish completed quickpoint projects with jewelry charms, beads, and bells. Use two or more strands of metallic or specialty needlepoint threads to outline and highlight the stitches. Have fun with found objects like fake gems, sequins, and trims. Stitch tree ornaments, Christmas stockings and home decor items with colorful holiday-themed yarns in a fraction of the time with quickpoint. Make your own quickpoint kits to give to someone who loves to needlepoint or who is interested in learning. Put together small kits of refrigerator magnets, bookmarks, and gift tags for stocking stuffers. Medium size kits can include designs for facial tissue box covers and coasters, while larger quickpoint projects can include enough yarn and canvas to create pillows, book covers, and more.